As school winds down and summer begins, many families look for activities to keep their children active throughout the season. Enrolling in camps for sports-loving kids is a popular choice to help them hone their skills. For avid soccer fans,Columbus Crew SC exclusive Camp Series, presented by OhioHealth, is a great option and one close to home. Campers can choose from either a Day Camp or Residential Camp for their experience. As an added bonus this year, campers who attend the Youth Residential Camp from June 19-June 24 will participate in Olympic Day on June 21! What is Olympic Day you ask? For starters, Olympic Day is held annually to commemorate the birth of the modern Olympic Games in 1984. Celebrated across the globe in more than 160 countries, Olympic Day’s mission is to promote fitness, well-being, culture and education, while promoting the Olympic values of excellence, friendship and respect. Columbus Crew SC, in conjunction with the Greater Columbus Sports Commission, will hold their Olympic Day celebration during the Residential Camp at MAPFRE Stadium, where campers will have the opportunity to meet former Olympian and Crew SC legend Frankie Hejduk! 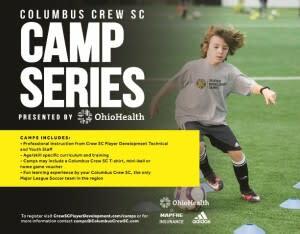 If you can’t make it to a Residential Camp, be sure to sign-up for the many Day Camps presented in the Crew SC Camp Series! Participants will receive professional instruction from Crew SC Player Development Technical and Youth Staff, age/skill specific curriculum and training, and much more. With several options, you’ll be sure to pick the best camp for your favorite soccer fan. You can check out all the Olympic Day action by following the Player Development Facebook, Twitter and Instagram accounts. You can visit the Columbus Crew SC Camp Series and the official Olympic Day site for more information.